Like any other type of lesson plans, the sheltered instruction observation protocol is a common Lesson Plan Templates that has been widely utilize in educational institutions. The purpose of SIOP lesson plan template is to assists teachers in teaching their students the proper use of language and linguistics. It is beneficial for teachers to make their teachings effective by using such template. The examples seen in the website template are free. It can be downloaded after selecting the appropriate SIOP lesson plan and later to be print. It is usually done in Microsoft Word or PDF file. 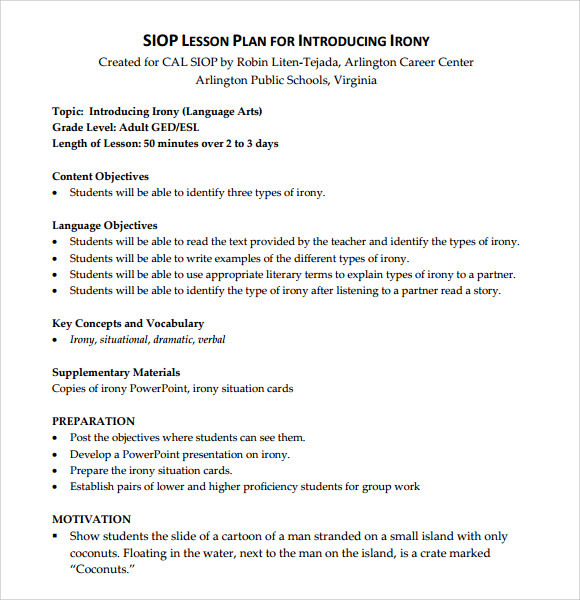 The SIOP lesson plan template is a tool solely for educational purposes. 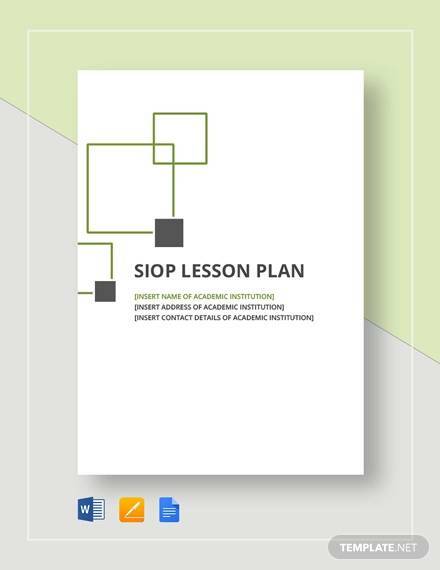 The SIOP lesson plan example template features the lesson plan which is very basic and aims at showcasing all the vital information about the lesson you are going to teach. Information like theme, objectives, learning strategies is given space in it. Also, a brief description is provided to you under the heads so that it becomes easy for you to write the content about them. 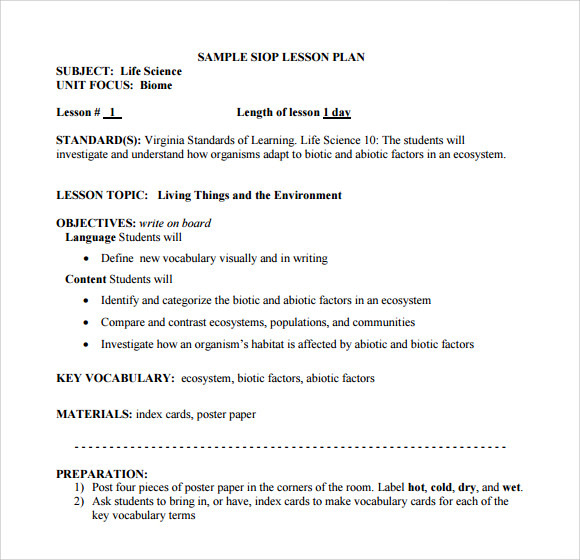 The SIOP lesson plan template 1 has a very crisp format which makes the content look presentable and neat. It features information like lesson sequence and reflections while highlighting the general details like date, class, theme, content objectives and language objectives which also have designated spaces to write the information about them. 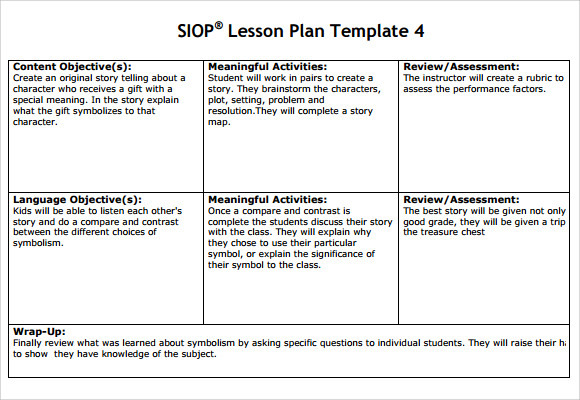 The SIOP lesson plans template provides you with a well framed lesson plan which is very easy to use. It is a pre-written example of a particular unit/ theme which aims at helping you in understanding that what all content is required to be filled in the columns provided in a lesson plan. 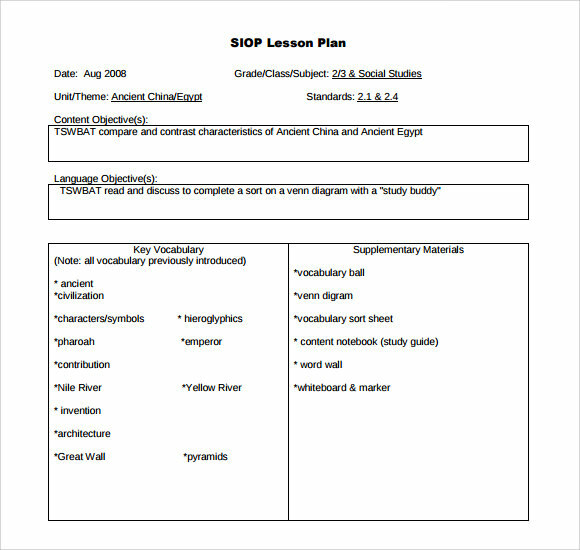 The SIOP lesson plan template 3 features a lesson plan which is a bit different from others and aims at portraying all the information in a much organised manner as it has separated columns for each head. It consists of information like topic, class, content objectives, common core standards, key vocabulary, materials and essential questions. 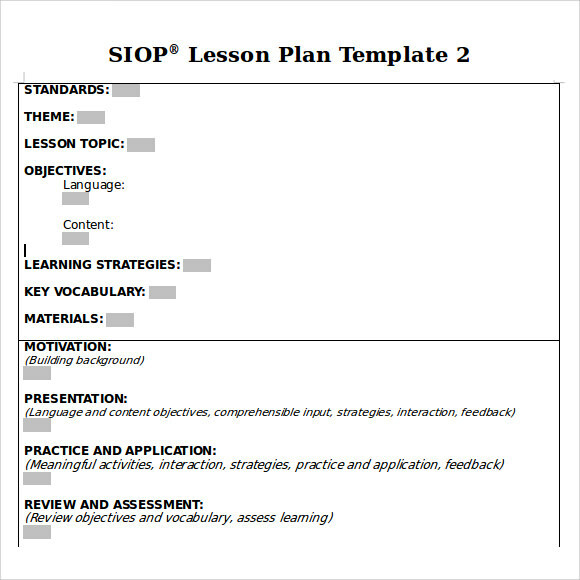 Why is the SIOP Lesson Plan Template Needed? 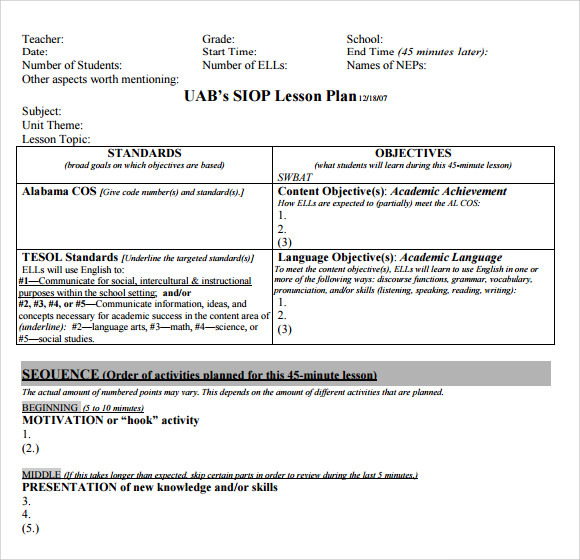 The SIOP lesson plan templates are needed for drafting the lesson plan which follows the format of SIOP. These templates consist of all the details in it already and you are just needed to fill in the information, so it is needed to save your time as well as your energy. They also provide you with examples which can be needed by you for going through the format and learn what all you need to write and how to write that content. These lesson plans are needed for making you prepared with the lesson you are going to teach.You can also see Math Lesson Plan Templates. 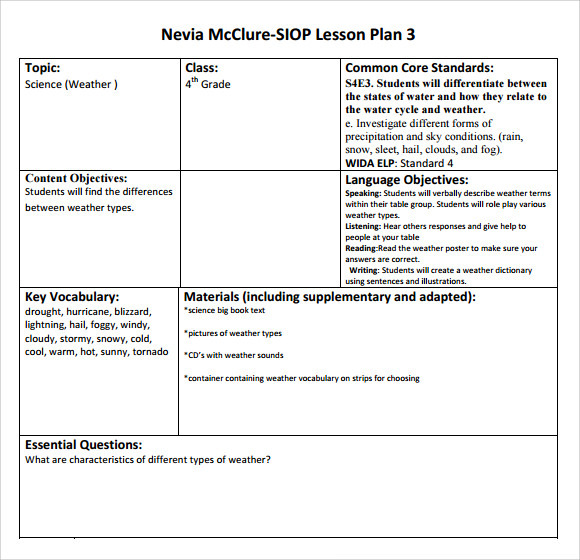 When is the SIOP Lesson Plan Template Needed? The SIOP lesson plan templates are needed when you need to prepare the lesson plans which help you in featuring all the information which is required according to the SIOP format. These are needed when you don’t have much time to write the format again and again for every new lesson as it provides you with the one. These lesson plans are also needed to ensure that the teacher is prepared before teaching about the content she/ he is going to teach. It is also needed to boost the confidence in teacher, especially when they are not much trained. There are several benefits which come along downloading the SIOP lesson plan templates. These templates help the teacher in making the teaching learning process effective by attaining the knowledge of how she is going to deliver the lesson to the students. Drafting the lesson plans in prior also provides time to the teachers for making the teaching aids or arranging the material to be required for activities while teaching to enhance the learning of the students and make it long lasting. Also, defining the goals in prior definitely helps them to achieve them as well. 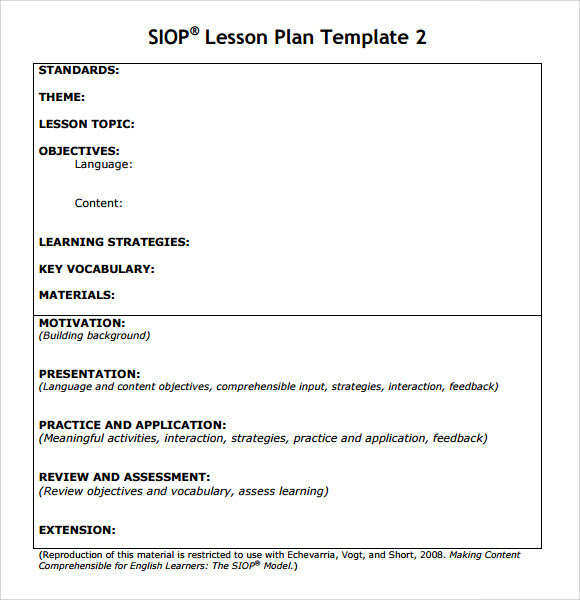 The SIOP lesson plan templates are very easy to download and use. 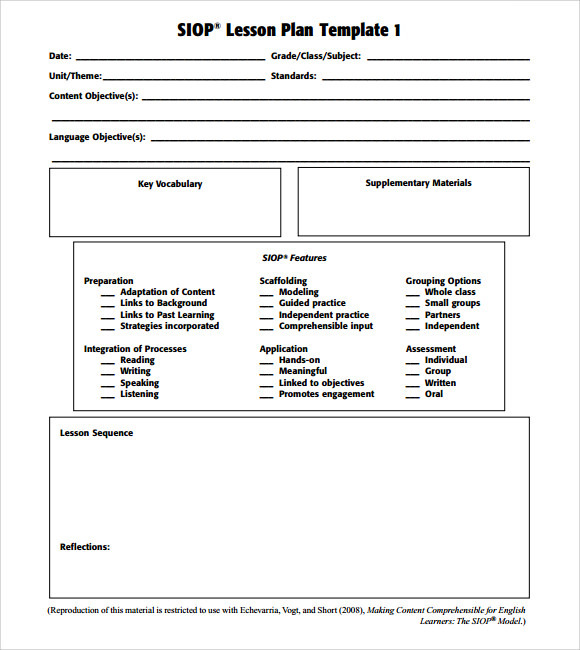 These templates are specially designed considering the format provided by SIOP. They are available in plentiful choices so that you can select the best one for you which suits your varied needs and purpose. They are great to use and make your work effortless.You can also see Elementary Lesson Plan Samples.